Yesterday Singapore, tomorrow Birmingham: LG Arena opening season announced | What Hi-Fi? The 30-year-old former NEC Arena has been completely revamped with new seating, bars and restaurants, and is due for completion in October. 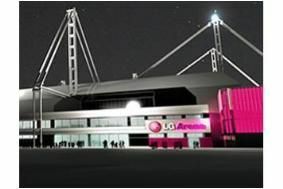 It became the LG Arena last year following a sponsorship deal, and the revitalised venue will carry the corporate logos and colour throughout. Among artists lined up for the opening season, which kicks off with Tom Jones on October 18, are Spandau Ballet, Green Day, Deep Purple, the Jonas Brothers, James Morrison, Simple Minds, Placebo and Status Quo. Meanwhile next February promises Elvis Presley in Concert, in which "Elvis sings lead vocals, as his songs and arrangements are played live by 21 musicians including some of his original band mates, backing vocalists and full orchestra". Tickets for all events are available via theticketfactory.